A masterpiece of elegance and technology, the Girard-Perregaux 1966 Minute Repeater unveils a magnificent mechanism that produces an intense sound. Its acoustic merits and the purity of its lines rely on over 220 years of tradition and excellence. The timepiece symbolises all the expertise of a brand that pushes back the boundaries of watchmaking with grandes complications. It is one of the few watches to combine mechanical excellence with exceptional musical qualities to such a degree. 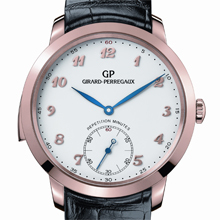 The Girard-Perregaux 1966 Minute Repeater model pays homage to the most prestigious of Haute Horlogerie traditions. Pure design, noble materials and a beautiful complication: the piece displays all the signs of an exceptional timepiece. Its classic, elegant exterior houses one of the greatest of grandes complications: the minute repeater. The invention of repeater watches was originally intended to meet the need to strike the hours during the night before the existence of electric lighting. Today, the charm of striking the hours, quarters and minutes makes it one of the best-loved complications for enthusiasts of beautiful watchmaking. 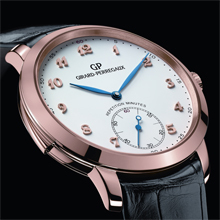 The construction of the Girard-Perregaux 1966 Minute Repeater watch fully respects the great watchmaking tradition. The creation of the sound relies on a device that requires the presence of two circular gongs coiled inside the case and small hammers that strike them at regular intervals. In order to create a vibration to produce the sound that comes closest to perfection, the tuning of the chimes remains one of the most delicate elements; one that Girard-Perregaux takes particular care in refining. The watch's special design required thorough research into acoustic qualities. In particular, the Manufacture worked on three construction points on the case. The diameter of the calibre and the interior diameter of the case are perfectly balanced, a ratio that guarantees maximum resonance. The case-back is curved in order to increase the volume of air between the movement and the case, which significantly improves the propagation of the sound. Finally, the lower part of the case-back is diamond-polished, an operation that allows acoustic interference to be reduced. In order to further highlight the nobility of the timepiece, craftsmen have taken great care over every aesthetic detail. The white enamel dial exhibits absolute restraint. The leaf-shaped blued hands and applied hour markers bear the unmistakable mark of purity. The watch contains a hand-wound mechanical movement equipped with a power reserve of over 4 days, housed in a pink-gold case with a diameter of 42 mm. Combined with its unique decoration and finishes, the watch is the most successful expression of a minimalistic philosophy. The desire for aesthetics is taken to the extreme. The master watchmakers have chosen a half-arrow shape recalling the gold Bridges, the brand's signature, in order to perfect the balance bridge of this meticulously decorated and rounded calibre. Rounding consists of filing the extremities of the arms in a perfectly regular manner in order to give them a semi-cylindrical shape, while at the same time respecting the delimitation of the centre and heels. In order to finalise the operation, the craftsmen smooth it using stones, buffs, pegwoods and diamond pastes in order to obtain perfect rounding. 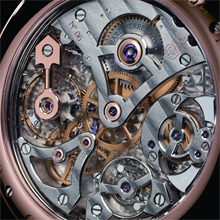 All the movement parts require the same care, thus blending function and design in a perfectly coherent relationship. bridge side, inverted minutes rack; conventional striking gongs.